Bixby Knolls is an area of Long Beach adjoining North Long Beach to the north, California Heights on the southeast, Wrigley on the southwest. Its approximate boundaries are the 405 Freeway to the south (or Wardlow Avenue), Del Amo Blvd to the north (or the Southern Pacific railroad tracks), the Los Angeles River and the Lakewood city boundary to the west of Atlantic Avenue, south of Bixby Road. Atlantic Avenue and Long Beach Boulevard are the main north-south arteries through the neighborhood. The neighborhood includes the Los Cerritos – Virginia Country Club and the original Los Cerritos Ranch House historic site. The majority of the homes in the area were custom-built between 1920 and 1940, providing a variety of home architecture. Small shops and restaurants dot a strip of Atlantic Avenue south of San Antonio and north of the 405 Freeway, as well as on the streets surrounding this main thoroughfare. The neighborhood is also served by several nearby grocery stores and shopping centers. 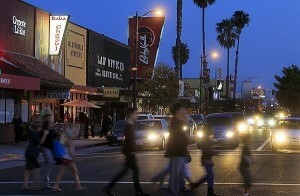 Bixby Knolls has an active local community. The Richard Goad Theater, home to the Long Beach Shakespeare Company, and the Historical Society of Long Beach, are housed on Atlantic Avenue, just north of Carson Street. On the west side of the neighborhood, adjacent to the Los Angeles River, is the large Virginia Country Club, which is also the location of the Rancho Los Cerritos historic site.